After our visit to the Georgian Trail in Grey County it was early afternoon and definitely time for lunch. The drive from Collingwood to Thornbury along the shorelines of Georgian Bay was pleasant and it did not take us long to arrive in the historic centre of Thornbury. Our destination was the Bruce Wine Bar and Kitchen which is tucked in behind a bank building on two levels with a nice patio outside. 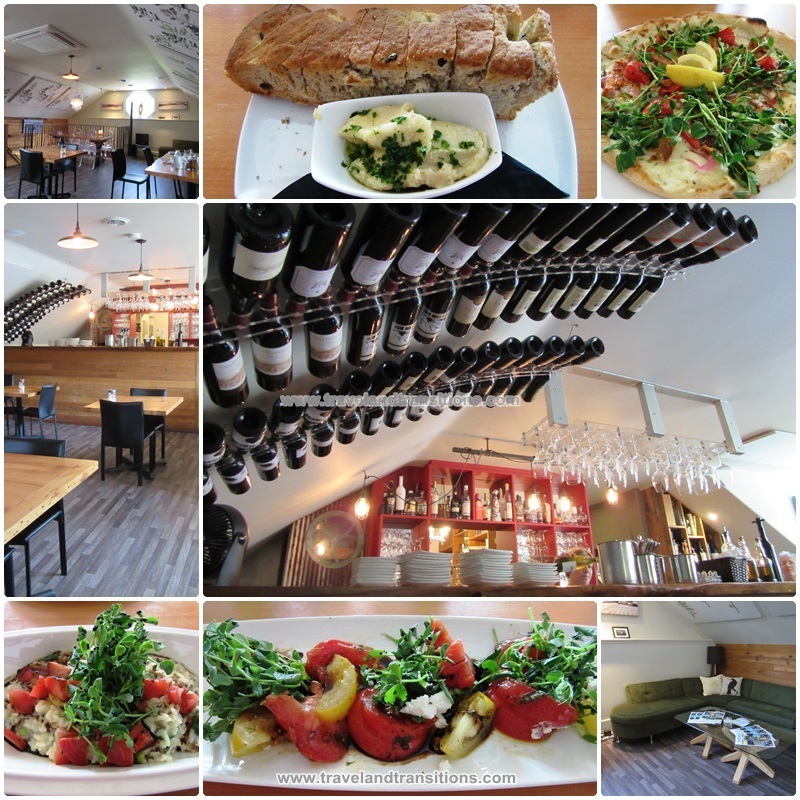 Downstairs you can eat traditional Neapolitan wood-fired pizzas, salads and sandwiches. Upstairs, the Wine Bar offers a range of fine wines, spirits and craft beer while dining options include delicious shared plates. And every Friday night there is live music. 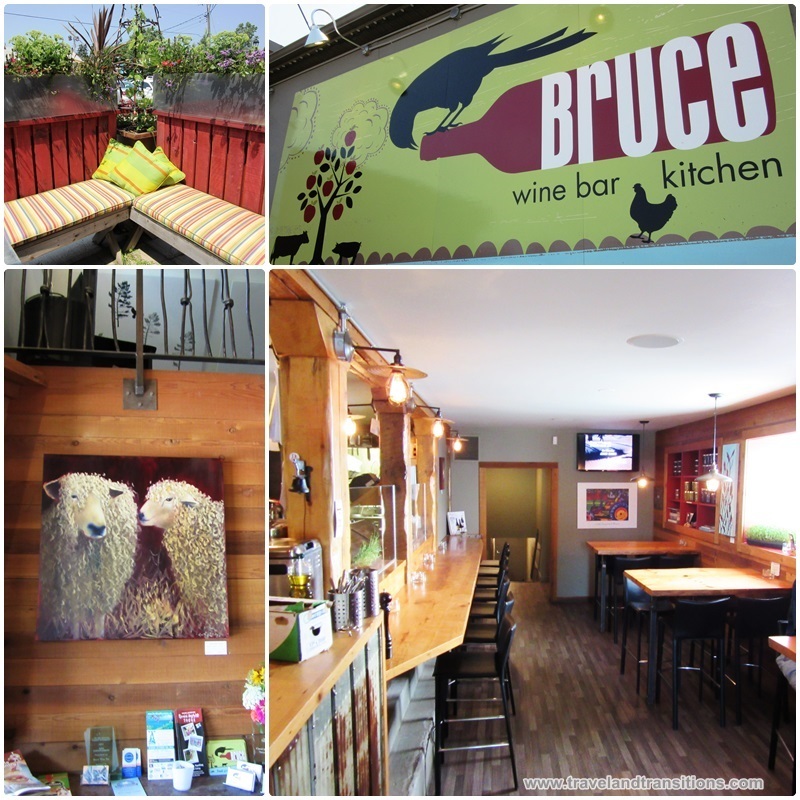 The mission at the Bruce Wine Bar in Thornbury reflects an emphasis on farm-to-fork food, local art displays, an impressive wine and craft beer list as well as indie musicians. We started lunch on our second day in Ontario’s Grey County with local tomatoes that came with Ontario goat cheese, peashoots and green olives in a basil lemon vinaigrette, followed by absolutely scrumptious warm local bread with compound butter. As a near vegetarian, I enjoyed the Risotto Carnaroli with seasonal vegetables, Ontario Romano and wild rice in a balsamic reduction. I also had a chance to sample the Smoked Kolapore Pizza which is made with black pepper smoked trout, roasted garlic and tyme cream, pea tenders, cherry tomatoes and pickled onion. Chef Shaun Edmonstone was born and raised here in Thornbury and brought his experience in five star restaurants back to his home town. In the late afternoon we made the scenic drive from Thornbury to the Pretty River Valley, an appropriate name for one of Southern Ontario’s most scenic valleys. Featuring one of the highest points of the Niagara Escarpment, this valley is also home to the Pretty River Valley Provincial Park which offers great hiking trails, interesting geological formations, a unique fauna and flora with more than 400 vascular plants and a great display of colour during the fall foliage season. Embedded inside this UNESCO World Biosphere Reserve is the Pretty River Valley Country Inn, one of Ontario’s finest inns. 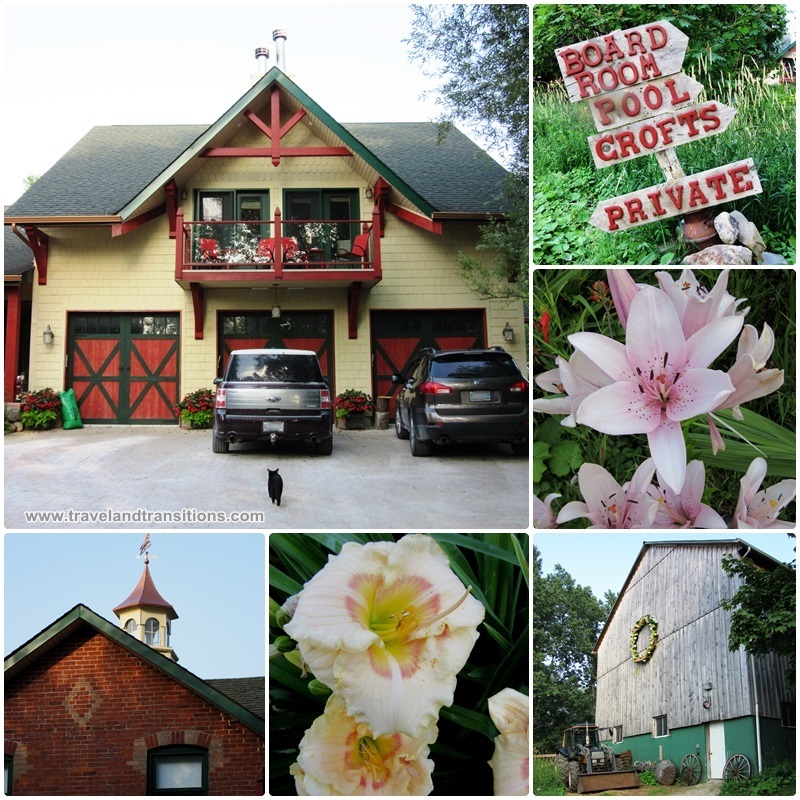 Linda Proudfoot owns this upscale country inn together with her husband Paul Bilewicz and together they have created a 125 acre retreat that is located in the heart of Southern Ontario’s most popular four-season getaway region. Linda took me on a tour of the main building which offers six studios and two suites. The rooms are cozy with a rustic décor, wood burning fireplaces, seating areas, fridges and private bathroom. Some of them also have two-person jacuzzis. Also located in the main building are a sitting room, a breakfast room and an indoor hot tub. Three complimentary beverage centres, home baked cookies and microwaves are placed strategically throughout the complex and a complimentary DVD lending library is located in the Log Great Room. The Pretty River Valley Country Inn is a popular escape rear-round for couples and families and it is also a trendy destination for a girls’ weekend getaway. After visiting the main building of the Pretty River Valley Country Inn, owner Linda Proudfoot took me on a tour of the 125 acre property which is located right inside the Niagara Escarpment, a UNESCO World Biosphere Reserve. We were accompanied by her two dogs and a cat who came along with us on the entire scenic stroll. The Pretty River Country Inn is an active organic farm where Linda and her husband Paul raise their own meat birds and rare breed pigs which are turned into bacon and breakfast sausages for the guests. They also produce their own maple syrup, honey and lavender jelly. 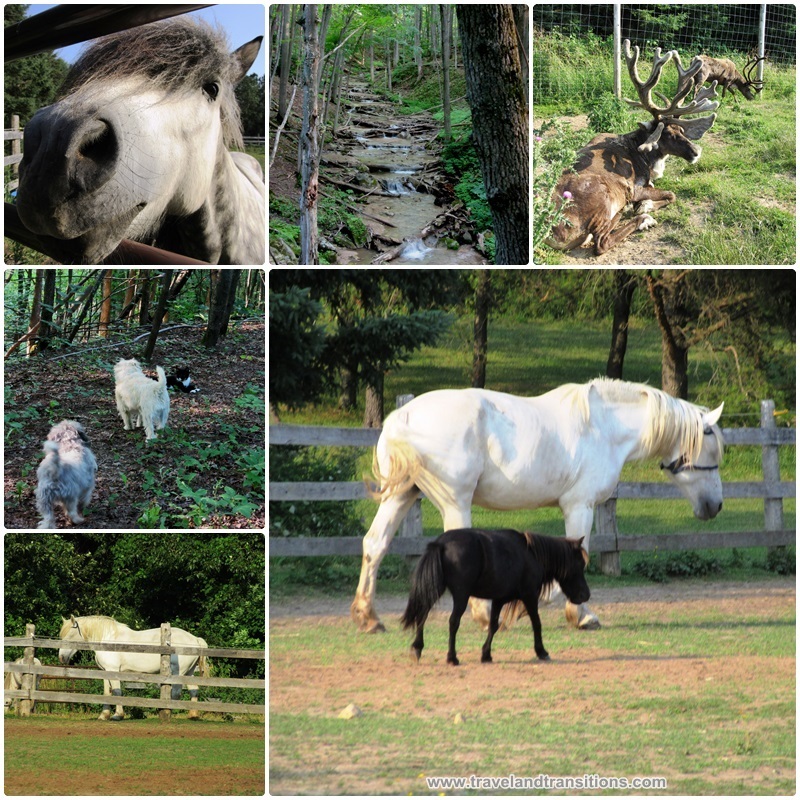 One of the most unique features of the Pretty River Valley Country Inn is indeed its collection of animals which include Icelandic, Minis and Percheron Horses and even Reindeer. Guests can enjoy the beautiful surroundings of the inn by going on a trek with the Icelandic Horses. Linda also mentioned another popular winter activity at the Pretty River Valley Inn: going snowshoeing in the middle of the night, a fabulous way to reconnect with nature In the Pretty River Valley. 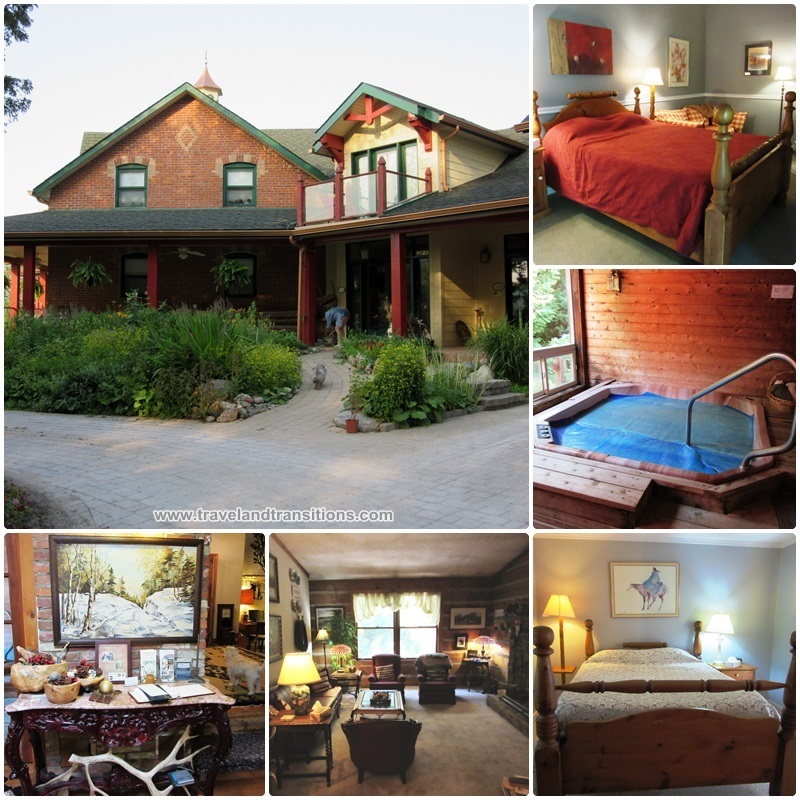 The Pretty River Valley Country Inn is a working organic farm. Linda Proudfoot and I continued our tour of the Pretty River Valley Country Inn and came to the Home Farm, the original homestead that was built in 1880. The flower gardens at the Home Farm are impressive and an outdoor saltwater pool invites guests to cool off on hot summer days. The lounge chairs by the pool are the perfect spot to while away a relaxing afternoon, with the views of the Niagara Escarpment providing an inspiring and tranquil natural setting. The Pretty River Valley Country Inn offers various promotions that enhance the relaxing aspect of a getaway or help guests take advantage of the outdoor opportunities in this special area. For example, a bit of pampering is included in the Girls’ Spa Getaway Weekend, the Sheer Indulgence Spa & Wine Tasting or the Couples Massage & Day at the Spa while outdoor activities are featured in the Scenic Caves Eco Adventures, Icelandic Trekking, Learn to Fly Fish or Golf at the Batteaux Golf Club. 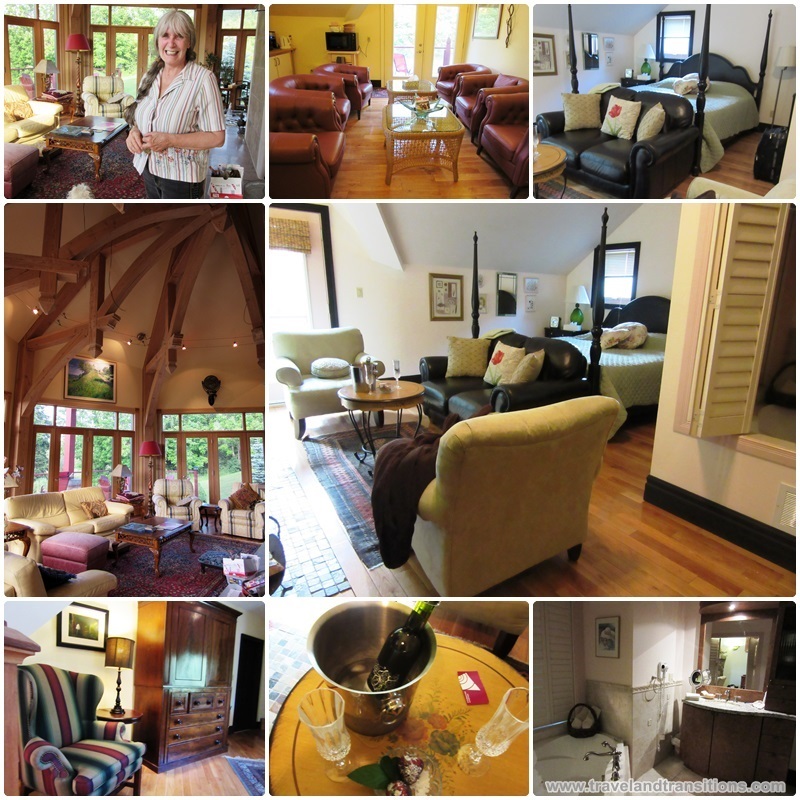 Last but not least, our tour of the Pretty River Valley Country Inn took us inside the Home Farm, the old farm homestead that now features a modern addition with three luxurious suites, all equipped with cathedral ceilings, wood burning fireplaces, and two-person Jacuzzis. We were staying in the Ben Nevis Croft which features a king size bed as well as a loft with two twin beds, which provides accommodation options for romantic getaways as well as families and groups of friends who are on a weekend escape together. Chocolate-dipped strawberries and a bottle of sweet local ice wine were waiting for us, a nice treat that we enjoyed while we were sitting on the balcony and taking in the natural surroundings of the Niagara Escarpment. This building also houses a fully equipped fitness centre with a shower and change area. Linda then took us into the Douglas Fir Great Room which has two-storey high panorama windows with awe-inspiring views of the escarpment. 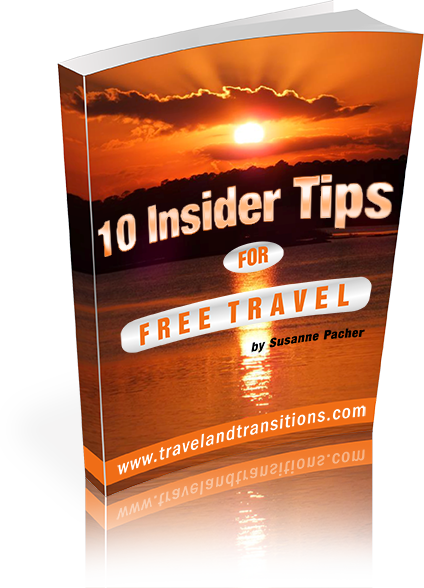 Even though this area is usually private and not accessible to guests, Linda and her husband Paul occasionally make it available for special events where it can hold up to 30 people. The Pretty River Valley Country Inn is a popular setting for weddings, family reunions, group golf getaways, therapeutic / yoga retreats and girls’ getaways.